A carburetor is a heart device for an automotive engine. It is constructed with many tiny orifices, plus many inaccessible areas. To clean the grease and varnish accumulated in there is becoming more difficult if using the traditional brush or scrubbing methods. Using either brushing, manual wash tank or aerosol sprays to clean carb can also be a real pain and time-consuming. Ultrasonic carburetor cleaner comes up with its advantages of efficiency and more clean power to solve your pain. 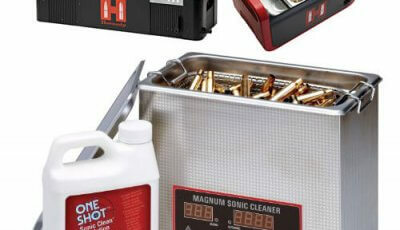 In this buying guide, I chose 4 top rated carb cleaners and gave brief reviews for each to help buyers get the best ultrasonic cleaner for carburetor cleaning. 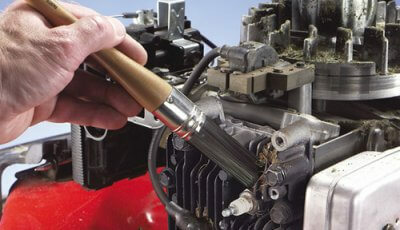 We also have other parts cleaners reviewed to give users wider option. 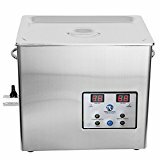 Like many other ultrasonic cleaners for the different function, ultrasonic carb cleaner also comes with a few key components, an ultrasonic generator, an ultrasonic transducer, and an ultrasonic tank or vessel. An ultrasonic generator can convert electronic power into a high magnitude of voltage and frequency, e.g 240V/60Hz to 2000V/40KHz. The high magnitude power can activate the ultrasonic transducer to create ultrasound wave. This ultrasound wave is actually the scrubbing force while it is driven through the fluid in the tank. While the transducer is vibrating at an ultrasonic frequency, there are millions of tiny bubbles formed in the fluid. These cavities bubbles will be exploded while contacting any wetted surface to release tremendous force, so as to blow away any stains and grease. 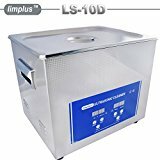 The ultrasonic cleaner is an ideal solution to clean up carburetor as its ultrasound wave generated in the solution can reach those tiny orifices and inaccessible areas. 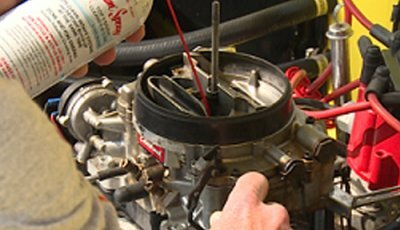 To add some specific chemical solution in the tank, the varnished carburetor can easily be restored to its like new condition within only 15 – 20 minutes. 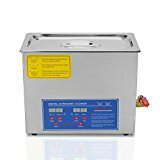 While you are considering to choose ultrasonic carb cleaner to replace your manual work, the cleaner’s tank size is always on the top list. To ask yourself, what dimension of carburetor you would like to clean? To measure the internal size of the tank rather than volume, you can make sure if the carb fits well in the tank for clean. 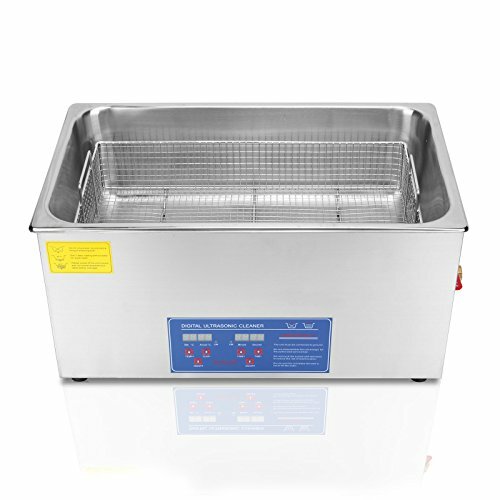 Most of the ultrasonic cleaners’ tank comes with a steel basket, which will reduce 8mm all round. If you use a steel basket in a tank, don’t forget that 8mm reduce in size. Most of the sellers have already listed all dimension features in cleaner’s specification. Just don’t miss them. Degassing is an additional function that can quickly remove air from fluid after solution changing. Degassing is not a function available for all cleaner models, but can make a clean process more effective in return. Some other features you should also pay attention to include heater capacity and LED display. 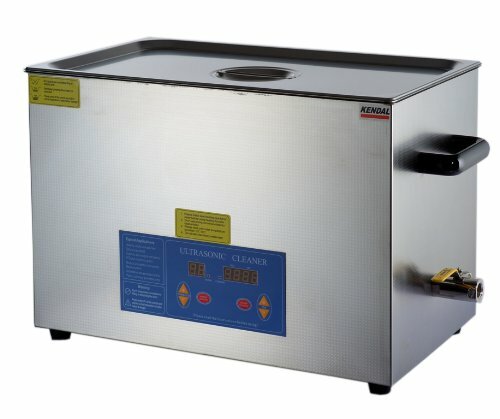 The ultrasonic cleaner comes with a heater which is always convenient to gain effective clean. LED display will show the water temperature, so users don’t have to plug their hand into the hot water. The heart of the ultrasonic cleaner is its transducer. The more transducer fitted to the ultrasonic bath, the better cleaning result will be. If you would like a more professional cleaning on a carburetor, the ultrasonic coming with more transducer can deliver you better result finally. 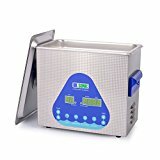 The following are some of the top-rated ultrasonic carb cleaners. You can compare their feature and functions to choose the best one to suit your own carburetor cleaning needs. What makes this ultrasonic unique is its dual frequency control functions. 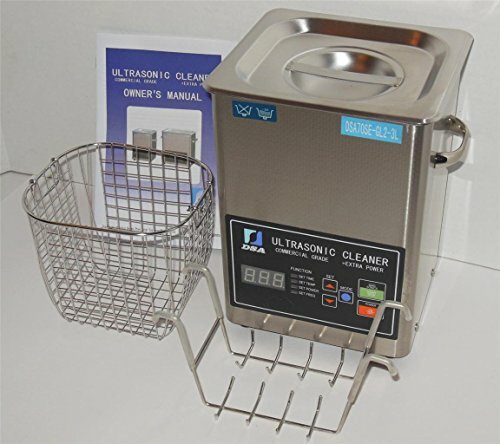 By doubling its frequency from 20KHz to 40KHz, this ultrasonic cleaner can effectively clean up anything put in the tank, e.g jewelry pieces, dental equipment, carb, gun parts and much more. The cleaner comes with the industrial grade transducer, along with sellers’ usage warning. The water used in the tank should be always warm or hot during the cleaning process, as the transducer is highly powered, even if the heater is turned off. If you use it to clean carburetor, you should always check its dimensions. Overall Dimensions: 10.5″ Tall x 8″ Wide x 7″ Deep, Inner Tank Size: Approx 6″ Tall x 6″ Wide x 5.5″ Deep. You had better choose larger tank size than your carb’s if you would like the more thorough cleaning. 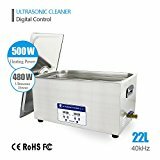 This Tel Motion ultrasonic cleaner is one of those machines that I highly recommend for the professional and commercial usage. The outstanding feature of this cleaner is its 6 set of built-in the transducer, which makes the machine powerful enough to clean up anything in efficiency. 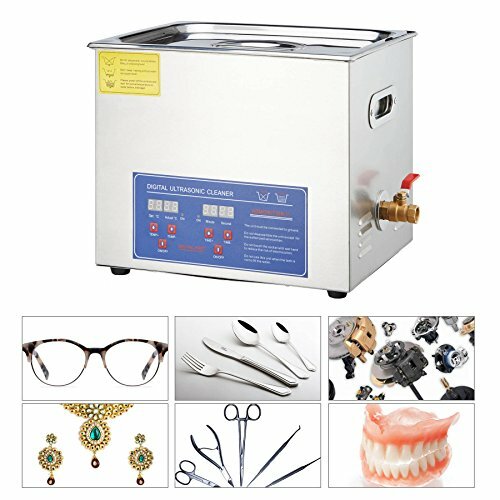 The Tek Motion ultrasonic jewelry cleaner can not only clean jewelry pieces but also perform excellently on many other domestic usages, e.g glasses, and timepieces, stationary equipment, metal articles, metal dishware etc. The cleaner comes with a tank capacity of 15L, measured 13 × 11 4/5 × 6 inches in tank size. That is large enough to hold most of the metal parts, gun parts, and even motorcycle carbs. If you are still not sure, just measure your own carbs size, then ask the seller for the internal tank dimension. From the previous customer review, this Tek Motion model is a fantastic carb cleaner as it helps make a 44 years old Z50 carb look and work brand new. 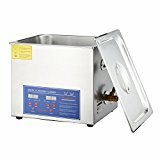 This FoodKing ultrasonic cleaner is another great addition to the list of cleaning small engine parts and carbs. 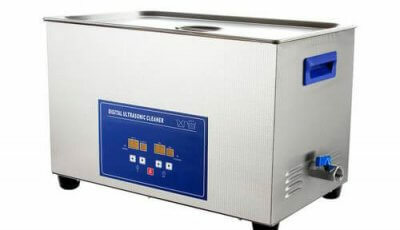 FoodKing ultrasonic cleaner has various tanks capacity. 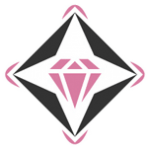 You can choose the most appropriate one for your own cleaning needs. If you would like to clean engine carbs, 6L or more should be your best option. 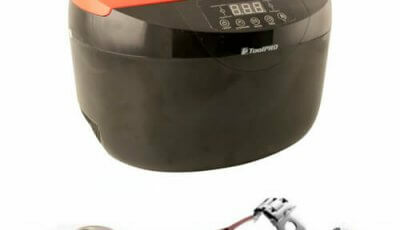 This FoodKing model features 22L tank capacity, 600W heating power, and 480W ultrasonic power. It is an industrial grade and commercially used cleaning machine for many auto repair shops, medical center etc. Normally, just using tap water is enough for the general cleaning. However, if you would like to enhance the cleaning result, or not satisfied with tap water cleaning, just add 5-10ML of detergent for the better look. 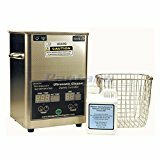 This Kendal commercial grade ultrasonic cleaner builds in 8 set of strengthened transducers. 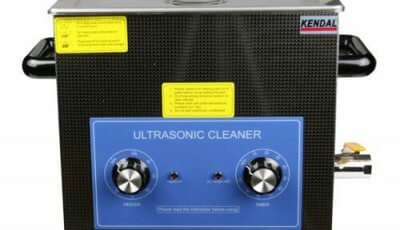 They can generate 42KHz and 480 Watts ultrasonic power for remarkable cleaning. Its tank size is measured with 19.5″ (L) x 12″ (W) x 6″ (H) and working capacity is 21L. It is perfect for cleaning large and long items. The general tap water can deliver you fantastic cleaning result. However, if you would like to clean auto carbs, some specific cleaning detergent, e.g simple green, Alconox etc, can give you a better result. In general, this Kendal HB821 model is a large cleaner to work for the purpose of industrial and commercial usage. From the previous customers’ review, it is one of the best Kendal commercial cleaners for the value. 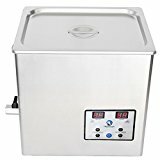 Read the full review for Kendal commercial ultrasonic cleaner here. Using an ultrasonic cleaner carburetor can ease your job a lot. These carb cleaners are very convenient and popular nowadays. You will not have to replace your carburetor every time it gets clogged or take it to the service to have it cleaned. As a matter of fact, by using ultrasonic carb cleaning machines, you can clean your carburetor by yourself to save time and money. Once all the parts of your carburetor are clean, let them dry out and reassembly your carburetor. 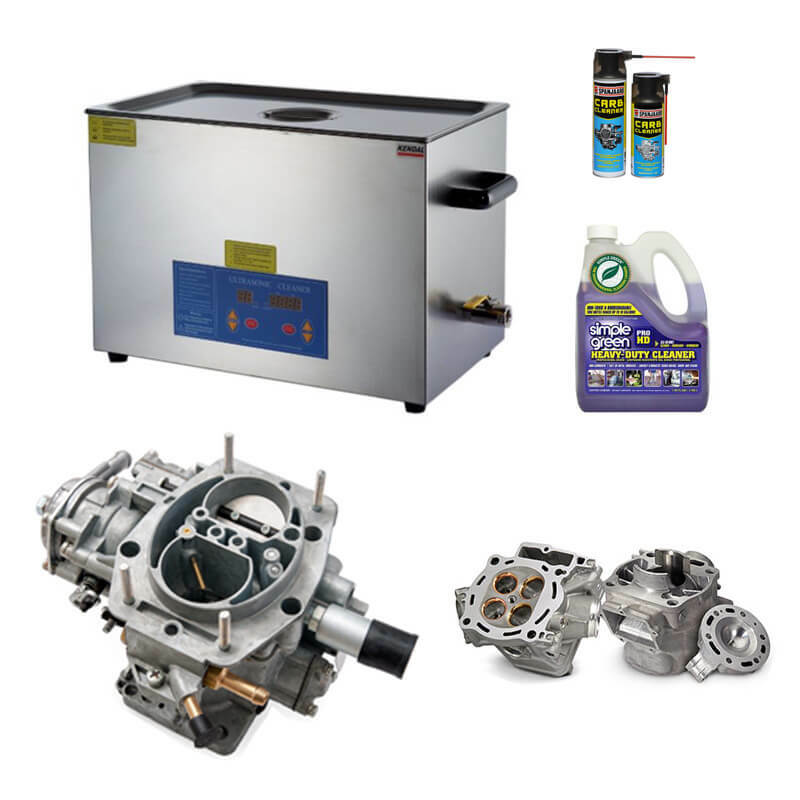 The advantages of using an ultrasonic carburetor cleaner are fairly obvious. Actually, these portable cleaning machines are very powerful and getting popular nowadays. You can simply clean your carburetor at home. Many carb cleaners can be set and forget. You can spend more time and effort on many other things during the cleaning process. For some dirty carb and engine parts, adding cleaning solution would be delivering the wonder result easily. How do you know what solution works best for your parts clean? You will need to use a special detergent with water to obtain the results that you want. 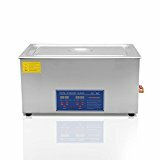 When choosing the best solution for ultrasonic cleaner, think of the following aspects and check the description of different solutions to see which one is made for your needs. Check out on the description of your cleaning solution if there are any steps you need to do after cleaning is over. Some solutions might leave a residue that you will have to wipe off while others won’t require any post cleaning action. But you never know until you check the instructions they come with.